Marble House in Newport. I’ve been a ton of times and bet you have too. The one absolutely incredible thing I’m embarrassed to admit I’ve missed all these years of going to the mansions is the Chinese style tea house out on the back lawn that overlooks the water. Flash forward to 1977 when the Tea House was moved back 75 feet from the edge of the property for safety reasons, and then to 2016 when it underwent a renovation. These days it’s not so much a tea room in the classic sense as it is the most beautiful snack bar you’ll probably come across in these continental United States. 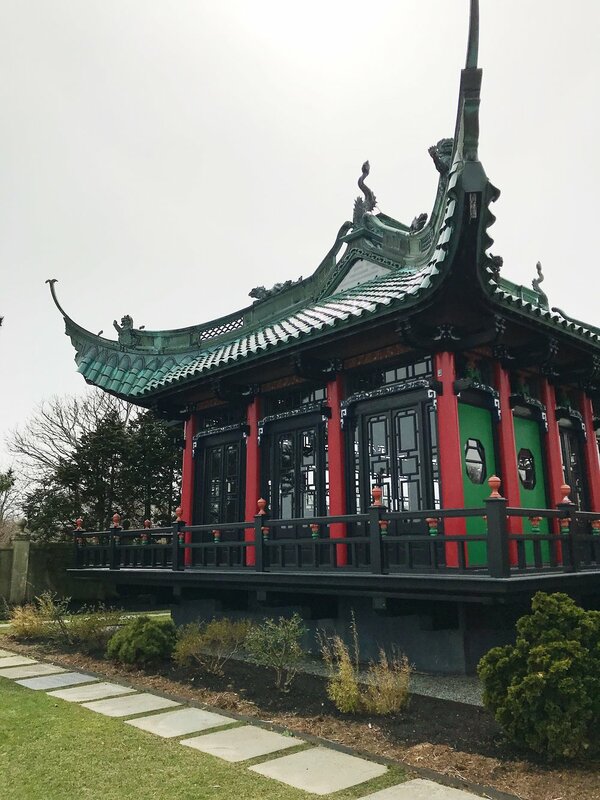 Still though, it is NOT to be missed next time you’re in the area and it’s accessible as part of the entry fee to Marble House. Grab a water, coffee, tea, or cookie and definitely snap some photos of the interior and exterior. Not gonna lie - I am more than a little surprised that I haven’t seen more people checking in from there over the years, it’s stunning! PS ~ One of the funniest things I read online whilst researching this post was courtesy of someone who had toured the main house in the last few years and mentioned the resemblance between the family photos and CNN news guy Anderson Cooper who is a descendant by way of his iconic mom Gloria.